The largest number of local men served during the Spanish-American War in Company D, Fifth Regiment, U. S. V.
Front row: James H. Richards and Nelson G. Foisie. Second row: James D. Maxim, Fred A. Thomas, James E. Murphy, Sampson McFarlin and Michael J. Cronan. Back row: Frank H. Chapman, Fred H. White, Robert (Henry) Boehme, Fred C. Chandler and Ernest C. Hannon. Private, Company D, Fifth Infantry, U. S. V.
Boehme who was known by his middle name of Henry was engaged as an edge setter in the local shoe industry. In 1897, he was employed by Leonard & Barrows and was residing on East Main Street with his family. He was in the second group of four Middleborough men that joined Company D following the recruitment rally in mid-summer 1898. Following his service, he returned to work at Leonard & Barrows and boarded close to work on Rice Street. He eventually relocated to St. Louis, where he continued to work in the shoe industry for a time. The death of Henry Boehme in Fayette, Mo., about a month ago, while known to intimate relatives, was not generally known among his former friends. Mr. Boehme was a native of Middleboro and passed his early days here. In the Spanish war he enlisted with Co. D, 5th Regiment of Plymouth and went into camp with them in Georgia. He was later employed as a shoemaker in St. Louis but his health failed him and for a few years he has been employed at Central College, Fayette, Mo. He leaves a wife and daughter. Brown had been serving as the pastor of the First Unitarian Church of Middleborough when he enlisted for service as a chaplain in the navy, resigning his pastorate in May, 1898. Rev. F. C. Brown, pastor of Unity church, received notice Thursday from the naval department at Washington that he had been appointed as chaplain in the United States Navy. The appointment is for five years and in the event of the threatened strife with Spain materializing Mr. Brown may have an opportunity at the outset of entering the service on a war footing. Mr. Brown has been pastor of Unity church since November, 1896. He remained in naval service as a chaplain through about 1902. He was the son-in-law of educator and Town Clerk Amos H. Eaton of Middleborough. Rev. Frederic C. Brown, minister of the First Unitarian society from October, 1896, to May, 1898, died in New York, Tuesday night. No particulars have been received. Mr. Brown married Emily, daughter of the late Amos H. Eaton, who survives him with two children. Since leaving Middleboro Mr. Brown has preached in Summit, N. J., and afterwards left the ministry. Even less is known of Chapman. He is listed among the original ten mustered into Company D from Middleborough. On his return from service, he was employed as a shoe worker with Leonard & Barrows at Middleborough, and boarded on Webster Street. rally in Middleborough, along with Boehme, Foisie and Hannon. Cronan was included in the first group of ten soldiers from Middleborough to be mustered into Company D. Like several others, he was initially engaged as a shoe worker and was employed by Leonard & Barrows following his military service. In the 1930s, he was working as an insurance agent. Mrs. Margaret Peterson, wife of Walter Peterson, of Mill street, and Mrs. Lillian Mitchell, wife of Warren Mitchell, of Somerville, flew from Logan International airport in East Boston yesterday to Washington, D. C., to attend the funeral services of their father, Michael J. Cronan, who died on Saturday in St. Petersburg, Fla., where he had been living for some years. His wife, Mrs. Cora Cronan, was expected to arrive in Washington by train from St. Petersburg yesterday. Funeral services for Mr. Cronan, a veteran of the Spanish-American war, will be held this morning in the National cemetery in Arlington, Va., across the Potomac from Washington. Mr. Cronan had reached his 75th birthday on January 3 of this year. He had been a resident of Middleboro for many years and for 25 years was an agent of the Metropolitan Life Insurance Company. Before entering the insurance business he had worked on the Taunton street railway. He was born in East Taunton, the son of Cornelius and Hannah (Ahearn) Cronan. He was a member of the Nemasket Tribe, Improved Order of Red Men. Mr. Cronan is survived by his widow, by four daughters, Mrs. Gordon Robbins, Mrs. George Rogers and Mrs. Walter Peterson, of Middleboro, and Mrs. Warren Mitchell, of Somerville; by one son, Howard F. Cronan of Putnam, Conn.; and one sister, Mrs. Michael D. Waldron of Utica, N. Y.
Cronan is buried in Arlington National Cemetery, section 34, site 783. Private, Company F, Twenty-First Infantry, U. S. A.
Durant was the son of Frank B. and Emma P. Durant. He served three enlistments and saw action both in Cuba during the Spanish American War and in the Philippines during the Philippine American War. Prior to the war in 1897, he was employed as a shoe worker by Leonard & Barrows and was residing on Forest Street. Durant first enlisted at Boston on May 3, 1898. At the time, he represented his age as 22 years and 8 months although it was likely that he was near to or was in fact under age. Durant served as a private in Company A, 7th Infantry, of the regular army, and saw action in Cuba at El Caney and San Juan Hill. He was discharged from service on February 15, 1899, at Camp Bacon, Minnesota. Edwards interrupted his studies at Dartmouth College in order to enlist immediately following the declaration of war in spring 1898. Following the war, he subsequently graduated and later coached at Oberlin College about a decade after the great John Heisman for whom the Heisman Trophy is named. The news of the death of Joseph Henry Edwards in Sanbornville, N. H., Monday was received with deep regret by his many friends. Mr. Edwards came to Middleboro when a young boy from Sandwich, and went to work for John M. Cushman on his farm and attended school. After graduation from the High school he entered Dartmouth College in 1895. When the Spanish-American was broke out, Mr. Edwards enlisted in a New Hampshire regiment. After his term of service he received an honorable discharge, returned to Dartmouth and graduated. While in college Mr. Edwards was probably as well known as any student, as he played with great success in the football team, playing at right tackle, and he was considered one of the most expert players ever on the Dartmouth team. After graduation he went to Oberlin College, Oberlin, Ohio, as an instructor in athletics where he became prominent in football circles as coach, carrying the team to victory in the state series for two consecutive years. Later, he taught school with success in Wolfboro Academy, and High schools in Maine and New Hampshire. In 1910 he married Mrs. Lillian Rogers of Sanbornville, N. H., where he has since carried on a farm. Mr. Edwards was about 40 years of age. He was a member of the Masons and the Knights of Pythias. Foisie was of French-Canadian heritage and was born in New Hampshire. It is not clear what his connection with Middleborough was, but he was mustered into Company D, Fifth Regiment as a result of the town’s recruitment rally in mid-1898, later serving in that unit’s band. At the time of the First World War he was residing in Nashua, New Hampshire, and operating a restaurant, the Colonial House, with Hector Bourque. By 1921, he had relocated to Wakefield, Massachusetts, where he was the proprietor of the Auto Lunch on Central Square. Foisie continued to reside on the North Shore where he continued in the restaurant business. His surname is sometimes erroneously given as Posey. Frank was born in Indiana, and was residing at Marion, Massachusetts, in 1880 with his mother Flora Frank and grandmother Hannah Swift. By 1895 he was in Middleborough where he was employed by Leonard & Barrows as a shoeworker. He was among the first men to enlist and was in the original group of ten that was mustered into Company D. Upon his return to Middleborough, he took a place with Hathaway, Soule & Harrington, shoe manufacturers. He was later a shoe worker in Whitman and Brockton, Massachusetts. Hannon was among the second wave of four Middleborough men who were mustered into service following the town’s mid-summer recruitment rally of 1898. Private, Co. B, Forty-Sixth Infantry, U. S. V.
Hayward served his enlistment in the Philippines. Although little is presently known regarding his service, the Middleboro Gazette reported in early 1900 that Hayward had been taken prisoner during an engagement. There seems to be no other local record substantiating or refuting this statement. Hayward returned home safely from the Philippines and at the time of his wedding in 1905, he was described as “a former resident on South street, and is well known in the vicinity.” He was a shoe worker and a resident of Abington, Massachusetts, by 1910. Corporal, Co. D, Fifth Infantry, U. S. V.
Holmes enlisted with other Middleborough men on June 24, 1898, at Plymouth, MA, and was mustered in with the rank of a corporal. Possibly this was due to skills which he had from his employment in Middleborough as a clerk. Holmes was a small man, described in 1913 as 5 feet 4½ inches tall, with a dark complexion with brown hair and brown eyes. Holmes served with the regiment until discharged November 31, 1899, at Greenville, SC. At the time, he may have been suffering from pulmonary tuberculosis, a disease with which he certainly later was afflicted. He was listed as being in divisional hospital in March, 1899, while still in camp. Undeterred, Holmes reenlisted on May 29, 1900, at Boston and ultimately served in the Philippines with the 12th Infantry for three years, being discharged on July 4, 1903 at Fort Douglas, Utah. He resided in California subsequent to his discharge and on April 22, 1913, was admitted to the Mountain Branch National Disabled Soldiers’ Home in Johnson City, Tennessee. Though he was discharged less than a month later on May 21, he was readmitted on October 20, 1913. Life in these homes was highly regimented and was patterned upon the military life to which its residents had at one time been accustomed. Holmes died of pulmonary tuberculosis on March 24, 1914, at 11:20 in the evening at the Mountain Branch Home, and was buried on March 27, 1914, in Mountain Home National Cemetery, Section A, Row 8, Site 4. He was the brother of Mrs. Mattie P. (Holmes) Egger of Middleborough. Mrs. William Egger received word this week of the death of her brother, George H. Holmes, at the National Soldiers’ Home in Johnson City, Tenn., Tuesday. Mr. Holmes, who passed the summer months here, was formerly a resident, being employed as a candy maker by the late Samuel S. Bourne, and later worked in Brockton. In the Spanish war he enlisted with Company D, Fifth Regiment, M. V. M., and when this command was mustered out of the U. S. service he reenlisted and served three years in the Philippines. He was 46 years of age. Private, First Battalion, U. S. M. C.
Like a number of the other Middleborough volunteers, Hopkins was an employee of Leonard & Barrows. For whatever reason, he chose not to enlist in Company D with them, but opted for the Marines Corps, enlisting on June 3, 1898. On May 4, Congress had authorized the expansion of the Marine Corps by the addition of another 1,640 men and Hopkins was among them. His unit was initially stationed at the Charlestown Navy Yard at Boston before shipping out to Cuba. In Cuba, Hopkins took part in the action around Santiago in late June and early July, and he was erroneously reported in Middleborough as having been killed. A rumor was current about town the first of the week that Chester Hopkins was dead from wounds received at Santiago. A letter was received from him by George W. Starbuck stating that he had been wounded in the hand slightly and that he was then in the marine barracks at Key West. He remained in the shoe manufacturing business for a number of years following his return. In 1915 he was named foreman of the sole leather department of the George E. Keith Company plant at Middleborough and was in 1918 appointed an inspector of shoes for the United States Army Quartermasters Corps. Later, he worked as a sorter in a shoe factory and resided in Rockland, Massachusetts. Humphrey is recorded as having been “the only Rock [Village] boy who was enlisted in the army.” In early May 1898, Humphrey enlisted in the Rhode Island militia and was mustered in at Quonset Point. He served with that regiment in camp until March 30, 1899, when he was mustered out at Columbia, South Carolina. By the age of fifteen, Maxim was already working as a teamster in Taunton. He resided in Taunton between East Taunton and North Lakeville on Middleboro Avenue “beyond the pond”. It is unclear what, if any, connection Maxim had with Middleborough. Following the war, Maxim returned to Taunton where he was engaged as a cooper. He later resided at Lakeville until 1925, working as a motorman on the street railway and later as a laborer for the Betty’s Neck Company. In 1925, Maxim relocated to Middleborough, but continued to by employed as a cranberry bog laborer. He is buried in the Pond Cemetery at Lakeville. James Maxim, 69, of Peirce street, died last Thursday night at Chelsea Naval hospital where he had been receiving treatment. He was born in New Bedford, the son of David and Orilla (Braley) Maxim and had lived for some time in Lakeville. The last eleven years he had spent here in Middleboro. He held membership in the Sons of Union Veterans and was a Veteran of the Spanish American War. He was formerly a motorman on the trolley cars running between [Middleborough] and New Bedford. His wife, Nellie (Cummings) Maxim survives. Funeral services were held Monday afternoon at 2.30 o’clcock at Egger Funeral Home and were conducted by the Rev. george Parker Jr. Internment was in Pond cemetery, Lakeville. A firing squad from the local Legion Post, in charge of Carl Kendall fired volleys at the grave. McFarlin was a shoeworker by trade at the time of his enlistment, working at the Hathaway, Soule and Harrington plant on Cambridge Street. After his return from service, he was engaged by Leonard & Barrows and boarded on Everett Street. In 1910 he moved to North Lakeville where he spent the remainder of his life. He is buried in the Richmond Cemetery on Taunton Street in Lakeville. Sampson McFarlin, retired shoe worker and correctional officer at the Briwgewater State Farm, died Sunday night at the home of his daughter, Mrs. Kenneth B. Keedwell on South Main street, at the age of 80. An unusually active man for his years, Mr. McFarlin was stricken with a heart attack last week while enjoying his favorite diversion of bowling at the YMCA and following hospitalization had returned to the home of his daughter to recuperate. He was a native of Carver, the son of Thomas H. and Susan (Hudson) McFarlin, and had lived on Taunton street in North Lakeville for 47 years. Mr. McFarlin was well known in the community through his many years of interest in the Nemasket Grange of which he was a past master. He was also a member of the Central Methodist Church, the Old Middleborough Historical Society and the Audubon Society. He was a veteran of the Spanish-American War and during World War II served as a fire warden in his locality. A man outspoken in his opinions on topics of the day, Mr. McFarlin was also known for his communications to the editor of [the Middleboro Gazette] and other publications. He is survived by six children: Mrs. Clarence Trenouth of Myricks, Mrs. Kenneth B. Keedwell of Middleboro, Mrs. Harold Frizzell of South Middleboro, Mrs. Charles Richards of Middleboro, William McFarlin of [Middleborough] and Thomas H. McFarlin of Weston. His first wife Pamela Caswell, died in1915 and his second wife, Myra Kelley, passed away in 1954. The Rev. George Emery, pastor of the Central Methodist Church, officiated at the funeral services held Tuesday afternoon at the Egger Funeral Home. Burial was in Richmond cemetery, North Lakeville. Following his war service, Moffatt took a position with Harvard University, was later employed in Missouri and acted as editor of the American Credit-Indemnity Quarterly. Corporal, Company D, Fifth Infantry, U. S. V.
Murphy, like his Middleborough comrades, was likely a shoe worker prior to his enlistment. Certainly upon his return, he engaged in that occupation, being employed by Leonard & Barrows. Sometime later he took a position with the New York, New Haven & Hartford Railroad, working in the Middleborough rail yard as a freight conductor. He died there in a tragic accident in December, 1912. James Murphy, aged 44 years, night freight conductor in the Middleborough yard, was instantly killed at 10.30 Wednesday night while at work in the local yard. He was riding on a flat car loaded with iron car frames, and was swinging off the side of the car which was near a cross over. There was another car on the next track, near the cross over, and as Murphy swung off the car he was riding on he was crushed between the two cars, which it is said, were quite close together on account of the tracks coming together for the switch, and the second car not being far enough ahead to fully clear the switch. Dr. A. V. Smith viewed the remains and the body was taken to the late home on Montello street. When word of the accident was received night operator Thibodeau called Dr. Cummings and also Rev. Fr. Thoms J. O’Neil, assistant at the Sacred Heart church, to offer spiritual consolation, but Murphy was dead when they reached him. His death is particularly pathetic as a wife and several children are left. Mr. Murphy had been employed by the railroad about seven years. He was formerly a baseball player here. He was a veteran of the Spanish-American war, being a member of Co. D, 5th regiment. The funeral will be held Saturday morning at 9 o’clcock at the Sacred Heart church. Murphy was buried in St. Mary’s Cemetery, Middleborough. Private, Company K, Twenty-First Infantry, U. S. A.
Reed, like so many others, was a shoe maker by occupation when he enlisted for three years on March 2, 1899 at Boston. The physical description of him left at the time indicated that he was 5 feet, 5¼ inches tall, with blue eyes, dark brown hair and a “florid” complexion. Richards was a Leonard & Barrows employee and boarding at Mrs. Julia Boardman’s summer boarding house on Vaughan Street in 1897. Here he was friendly with Eli Boardman who also enlisted in Company D but apparently failed to pass the physical examination. Richards himself was successful and served his full enlistment with the regiment as an “artificer”. Musician, Battery F, First Regiment, Massachusetts Heavy Artillery. Though Shaw undoubtedly felt that his skills as a mechanic would find use in a heavy artillery regiment, he ultimately served as the battery’s musician. Shaw spent the duration of the war at Fort Warren in Boston, and the battalion’s history has been well documented. He spent the latter half of his life in California, continuing to work as a machinist. Virtually nothing is presently known of Shores’ service during the war. He is recorded on the 1930 census as a Spanish-American War veteran and in 1906, the Middleboro Gazette reported the completion of his term of enlistment in the Navy. During World War I, he served on the committee on recruitment in Middleborough. Private, Company D, Eighth Regiment, U. S. V.
Shores was the older brother of Harry J. Shores. He enlisted June 22, 1898. By mid-July, Shores was at Chickamauga Park in Georgia. The company was mustered out of service April 28, 1899. Robert M. Shores was residing in the Veterans’ Hospital in Rutland, Massachusetts, in 1930. Although his obituary in the Middleboro Gazette fails to mention his service in the war, it is verified in the 1930 Federal census and pension records. Robert E. [sic] Shores, 61, for many years a resident of this town died in Rutland Wednesday. He was born in Wareham, the son of Albert and Phoebe (Stevens) Shores and lived in this town during his early life being employed as a shoeworker. For many years he has made his home in Mansfield. Two brothers, Fred Shores and Harry Shores of this town, survive. The funeral was held this afternoon with internment in Center cemetery, Wareham. Smith was the son of James Smith of Everett Street. Although this was the same regiment in which Alton B. Durant also served, it may be that Smith was unaware of this. He enlisted on May 2, 1898, at Boston, one day prior to Durant, and by May he had made his way with his regiment to Chickamauga Park. The regiment fought at El Caney and San Juan Hill in Cuba where Smith saw action and was fortunate to escape injury. 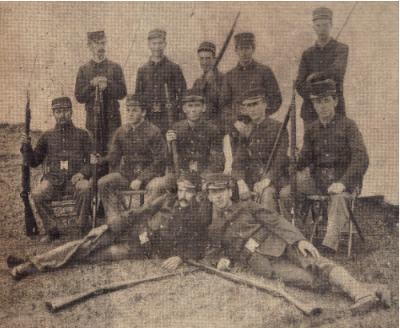 Company C was mustered out February 12, 1899, at Fort Wayne, Michigan. Smith resided in New Hampshire subsequent to his discharge. Like George H. Holmes, Smith spent his later years in a National Soldiers’ Home, in this instance at Dayton, Ohio. Smith was admitted in April, 1928, at the age of 57, suffering from arthritis, chronic myocarditis, and chronic bronchitis. He was described as being 5 feet 7 ½ inches tall, with blue eyes and brown hair. Also like so many of his Middleborough comrades, Smith was a shoe maker by trade. Taylor served his enlistment aboard the U. S. S. Catskill, a Civil War era monitor built in 1862. Outdated, the vessel was re-commissioned for patrol duty in the waters of New England in order to free more modern craft for duty in the war zone. The monitor served from April 16 through September 22. Following the war, Taylor was employed as a firefighter in Boston. Not much is known of Thomas’ enlistment or service. After completing his military duties, he was employed by Leonard & Barrows. He was later a noted construction contractor in Middleborough (his sons would later establish Thomas Brothers). He is buried at Nemasket Hill Cemetery in Middleborough. Fred A. Thomas, 66, a lifelong resident of [Middleboro] and Lakeville and prominent in the affairs of the Central Baptist church and the community died Wednesday night at St. Luke’s hospital where he had been removed from his home on Bloomfield avenue less than a week ago. Mr. Thomas was born on July 10, 1878, the son of George B. and Mary O. (Clark) Thomas. In his early years he was engaged in farming in Lakeville, was a salesman for the old Youth’s Companion and worked for a brief period in a local shoe factory. Some years ago Mr. Thomas became associated with the Atwood-Thomas Construction Company and for twelve years was engaged in road and bridge building, a large part of the firm’s work being carried out in Vermont following the disastrous flood of 1927. During this period he was the first to build a modern two-lane concrete highway in that state. In 1932 he gave up the contracting business and from that time until 1941 conducted the Middleboro Motor Sales garage on Wareham street, the scene of the bad fire last Saturday afternoon. Of late he had been associated with his sons, Arnold, George and Caleb in the conduct of their general contracting business and had been active in its work until stricken with shock about a week ago. He was a veteran of the Spanish-American war. One of Mr. Thomas’ greatest interest was in the affairs of the Central Baptist church of which he was a lifelong member and was serving as deacon at the time of his death. For nearly 20 years he served as superintendent of the Sunday school and was a past president of the Men’s class. He was also an ardent sports fan and in his early years participated in many athletic events. Surviving are his widow, Ruby (Howes) Thomas; three sons, Arnold L., and Caleb A., of [Middleboro] and George B., now a sergeant with the U. S. Army Engineers in New Guinea; three daughters, Mrs. Sybil Ryder and Mrs. Florence Cummings of [Middleboro] and Myra, a second lieutenant in the army nurse corps; a sister, Mrs. Lillie S. Nelson of Jamaica Plain, and a brother, Elmer Thomas of Waltham. The Rev. James L. Hynes, pastor of the Central Baptist church, will conduct the services Saturday afternoon at 2.30 o’clock from the Egger Funeral home and burial will be in the Nemasket Hill cemetery. Tinkham was the son of George W. Tinkham. The circumstances surrounding his death are not known, although he died shortly after the conclusion of the war. He is buried in the Reed Cemetery on Marion Road in Middleborough, and his grave is marked by a marble stone supplied by the government in 1900. Private, Twenty-Sixth Infantry, U. S. A. Like a number of other local soldiers, White was a first generation American, his parents having been born in Germany. F. H. White of Middleboro, a member of New England’s volunteer regiment, the Mass. 26th infantry, is on his way home with the regiment after nearly two years’ service in the Philippines. The 26th has been in several battles with the Paney insurgents and has always come out victorious. In 1930, he was employed as a fireman in the “navy yard” and was residing at Quincy. Middleboro Gazette, May 28, 1909:6 (employed in St. Louis); July 7, 1916:1 (obituary); “What the Gazette Was Saying Twenty Five Years Ago”, July 6, 1923:6 (enlists); April 4, 1924:6 (named among returning soldiers); “Old Middleborough”, July 17, 1931:1 (pictured as member Co. D)/National Archives and Records Administration. Civil War Pension Index: General Index to Pension Files, 1861-1934 (on-line database). Provo, UT: Ancestry.com Operations Inc, 2000. Original data: General Index to Pension Files, 1861-1934. Washington, D.C.: National Archives and Records Administration. T288, 544 rolls./Resident and Business Directory of Middleboro, Massachusetts. For 1897. (Needham, MA: A. E. Foss & Co., nd. ), p. 55./Resident and Business Directory of Middleboro’ and Lakeville, Massachusetts, for 1899. (Needham, MA: A. E. Foss & Co., nd. ), p. 55. Middleboro Gazette, “What the Gazette Was Saying Twenty Five Years Ago”, June 22, 1923:9 (enlists); ibid., June 29, 1923:9 (ships out from town); ibid., March 28, 1924:6 (soldier in divisional hospital); ibid., April 4, 1924:6 (named among returning soldiers); “Old Middleborough”, July 17, 1931:1 (pictured as member Co. D)/National Archives and Records Administration. Civil War Pension Index: General Index to Pension Files, 1861-1934 (on-line database). Provo, UT: Ancestry.com Operations Inc, 2000. Original data: General Index to Pension Files, 1861-1934. Washington, D.C.: National Archives and Records Administration. T288, 544 rolls. Middleboro Gazette, “What the Gazette Was Saying Twenty Five Years Ago”, July 13, 1923:5 (member Co. D); ibid., April 4, 1924:6 (named among returning soldiers); “Old Middleborough”, July 17, 1931:1 (pictured as member Co. D)/National Archives and Records Administration. Civil War Pension Index: General Index to Pension Files, 1861-1934 (on-line database). Provo, UT: Ancestry.com Operations Inc, 2000. Original data: General Index to Pension Files, 1861-1934. Washington, D.C.: National Archives and Records Administration. T288, 544 rolls/Resident and Business Directory of Middleboro’ and Lakeville, Massachusetts, for 1899. (Needham, MA: A. E. Foss & Co., nd. ), p. 61. Middleboro Gazette, “What the Gazette Was Saying Twenty Five Years Ago”, July 6, 1923:6 (enlists); ibid., April 4, 1924:6 (named among returning soldiers)/National Archives and Records Administration. Civil War Pension Index: General Index to Pension Files, 1861-1934 (on-line database). Provo, UT: Ancestry.com Operations Inc, 2000. Original data: General Index to Pension Files, 1861-1934. Washington, D.C.: National Archives and Records Administration. T288, 544 rolls. Middleboro Gazette, “Middleboro”, July 17, 1914:8 (to start Spanish War veterans group); “What the Gazette Was Saying Twenty Five Years Ago”, June 22, 1923:9 (enlists); ibid., June 29, 1923:9 (ships out from town); ibid., January 18, 1924:7 9 (prison guard at Greenville); ibid., April 4, 1924:6 (named among returning soldiers); “Old Middleborough”, July 17, 1931:1 (pictured as member Company D); “Recent Death”, February 28, 1952:7 (obituary)/National Cemetery Administration. U.S. Veterans Gravesites, ca.1775-2006 (on-line database). Provo, UT: Ancestry.com Operations Inc, 2006. Original data: National Cemetery Administration. Nationwide Gravesite Locator/Resident and Business Directory of Middleboro’ and Lakeville, Massachusetts, for 1899. (Needham, MA: A. E. Foss & Co., nd. ), p. 65/United States Federal Census. Year: 1930; Census Place: Middleborough, Plymouth, Massachusetts; Roll 940; Page: 15A; Enumeration District: 79; Image: 613.0. Ancestry.com. 1930 United States Federal Census (on-line database). Provo, UT: Ancestry.com Operations Inc, 2002. Original data: United States of America, Bureau of the Census. Fifteenth Census of the United States, 1930. Washington, D.C.: National Archives and Records Administration, 1930. T626, 2,667 rolls. Middleboro Gazette, “What the Gazette Was Saying Twenty Five Years Ago”, February 22, 1924:6 (mustered out after action in Cuba)/Resident and Business Directory of Middleboro, Massachusetts. For 1897. Needham, MA: A. E. Foss & Co., nd., p. 70/U.S. Army, Register of Enlistments, 1798-1914 [database on-line]. Provo, UT, USA: Ancestry.com Operations Inc, 2007. Original data: Register of Enlistments in the U.S. Army, 1798-1914 (National Archives Microfilm Publication M233, 81 rolls); Records of the Adjutant General’s Office, 1780’s-1917, Record Group 94; National Archives, Washington, D.C./United States Federal Census. Year: 1900; Census Place: Corregidor Island, Philippine Islands, Military and Naval Forces; Roll T623_1840; Enumeration District: 174. Ancestry.com. 1900 United States Federal Census [database on-line]. Provo, UT, USA: Ancestry.com Operations Inc, 2004. Original data: United States of America, Bureau of the Census. Twelfth Census of the United States, 1900. Washington, D.C.: National Archives and Records Administration, 1900. T623, 1854 rolls. Middleboro Gazette, August 5, 1910:4 (weds Lillian Sanborn Rogers); March 10, 1911:4 (in sleigh accident); July 28, 1911:2, 3 (death notice obituary); “What the Gazette Was Saying Twenty Five Years Ago”, June 18, 1920:3 (attends Dartmouth); ibid., October 6, 1922:8 (plays football at Dartmouth); ibid., November 10, 1922:5 (appears in Illustrated American); ibid., April 27, 1923:5 (enlists in NH National Guard); ibid., August 3, 1923:6 (regiment on way to Puerto Rico); ibid., December 7, 1923:6 (attends Dartmouth). United States Federal Census. Year: 1930; Census Place: Stoneham, Middlesex, Massachusetts; Roll 929; Page: 3A; Enumeration District: 466; Image: 641.0. Ancestry.com. 1930 United States Federal Census (on-line data base). Provo, UT: Ancestry.com Operations Inc, 2002. Original data: United States of America, Bureau of the Census. Fifteenth Census of the United States, 1930. Washington, D.C.: National Archives and Records Administration, 1930. T626, 2,667 rolls/The Wakefield, Stoneham, Reading, North Reading and Lynnfield Massachusetts Directory 1921-1922 (Salem, MA: The Henry M. Meek Publishing Co., 1921), p. 380/World War I Draft Registration Cards. Registration Location: Hillsborough County, New Hampshire; Roll 1711720; Draft Board: 1 Ancestry.com. World War I Draft Registration Cards, 1917-1918 (on-line database). Provo, UT: Ancestry.com Operations Inc, 2005. Original data: United States, Selective Service System. World War I Selective Service System Draft Registration Cards, 1917-1918. Washington, D.C.: National Archives and Records Administration. M1509, 4,582 rolls. Middleboro Gazette, “What the Gazette Was Saying Twenty Five Years Ago”, June 22, 1923:9 (enlists); ibid., June 29, 1923:9 (ships out from town); ibid., April 4, 1924:6 (named among returning soldiers); “Old Middleborough”, February 18, 1927:1 (1896 YMCA class pictured)/Resident and Business Directory of Middleboro’ and Lakeville, Massachusetts, for 1899 (Needham, MA: A. E. Foss & Co., nd. ), p. 74/United States Federal Census. Year: 1880. Census Place: Marion, Plymouth, Massachusetts; Roll T9_550; Family History Film: 1254550; Page: 571.1000; Enumeration District: 545; Image: 0151. Ancestry.com and The Church of Jesus Christ of Latter-day Saints. 1880 United States Federal Census (on-line database). Provo, UT: Ancestry.com Operations Inc, 2005. Original data: United States of America, Bureau of the Census. Tenth Census of the United States, 1880. Washington, D.C.: National Archives and Records Administration, 1880. T9, 1,454 rolls/United States Federal Census. Year: 1910. Census Place: Whitman, Plymouth, Massachusetts; Roll T624_613; Page: 11B; Enumeration District: 1252; Image: 487. Ancestry.com. 1910 United States Federal Census (on-line database). Provo, UT: Ancestry.com Operations Inc, 2006. Original data: United States of America, Bureau of the Census. Thirteenth Census of the United States, 1910. Washington, D.C.: National Archives and Records Administration, 1910. T624, 1,178 rolls/United States Federal Census. Year: 1920. Census Place: Brockton Ward 7, Plymouth, Massachusetts; Roll T625_725; Page: 6A; Enumeration District: 93; Image: 409. Ancestry.com. 1920 United States Federal Census (on-line database). Provo, UT: Ancestry.com Operations Inc, 2009. Middleboro Gazette, December 29, 1905:1 (weds Maria T. Bennett); “What the Gazette Was Saying Twenty Five Years Ago”, January 30, 1925:7 (taken prisoner in Philippines)/National Archives and Records Administration. Civil War Pension Index: General Index to Pension Files, 1861-1934 (on-line database). Provo,UT: Ancestry.com Operations Inc, 2000. Original data: General Index to Pension Files, 1861-1934. Washington, D.C.: National Archives and Records Administration. T288, 544 rolls/United States Federal Census. Year: 1910; Census Place: Abington, Plymouth, Massachusetts; Roll T624_610; Page: 13B; Enumeration District: 1173; Image: 978. Ancestry.com. 1910 United States Federal Census (on-line database). Provo, UT: Ancestry.com Operations Inc, 2006. Original data: United States of America, Bureau of the Census. Thirteenth Census of the United States, 1910. Washington, D.C.: National Archives and Records Administration, 1910. T624, 1,178 rolls/United States Federal Census. Year: 1930; Census Place: Abington, Plymouth, Massachusetts; Roll 938; Page: 10A; Enumeration District: 1; Image: 463.0. Ancestry.com. 1930 United States Federal Census (on-line database). Provo, UT: Ancestry.com Operations Inc, 2002. Original data: United States of America, Bureau of the Census. Fifteenth Census of the United States, 1930. Washington, D.C.: National Archives and Records Administration, 1930. T626, 2,667 rolls/World War I Draft Registration Cards. Registration Location: Plymouth County, Massachusetts; Roll 1684751; Draft Board: 37. World War I Draft Registration Cards, 1917-1918 (on-line database). Provo, UT: Ancestry.com Operations Inc, 2005. Original data: United States, Selective Service System. World War I Selective Service System Draft Registration Cards, 1917-1918. Washington, D.C.: National Archives and Records Administration. M1509, 4,582 rolls. Middleboro Gazette, March 28, 1913:8 (is in California); March 27, 1914:8 (obituary); “What the Gazette Was Saying Twenty Five Years Ago”, June 22, 1923:9 (enlists); ibid., June 29, 1923:9 (ships out from town); ibid., March 28, 1924:6 (in divisional hospital); ibid., April 4, 1924:6 (named among returning soldiers)/National Cemetery Administration. U.S. Veterans Gravesites, ca.1775-2006 (on-line database). Provo, UT: Ancestry.com Operations Inc, 2006. Original data: National Cemetery Administration. Nationwide Gravesite Locator/Resident and Business Directory of Middleboro, Massachusetts. For 1897 (Needham, MA: A. E. Foss & Co., nd. ), p. 80/Resident and Business Directory of Middleboro’ and Lakeville, Massachusetts, for 1899 (Needham, MA: A. E. Foss & Co., nd. ), p. 81/U.S. National Homes for Disabled Volunteer Soldiers, 1866-1938 (on-line database). Provo, UT: Ancestry.com Operations Inc, 2007. Original data: Historical Register of National Homes for Disabled Volunteer Soldiers, 1866-1938; (National Archives Microfilm Publication M1749, 282 rolls); Records of the Department of Veterans Affairs, Record Group 15; National Archives, Washington, D.C.
Middleboro Gazette, April 16, 1915:3 (named Keith foreman); March 15, 1918:1 (named inspector for US Army); “What the Gazette Was Saying Twenty Five Years Ago”, June 8, 1923:9 (enlists in Marines); ibid., July 13, 1923:5 (wounded at Santiago); ibid., March 14, 1924:6 (discharged)/Resident and Business Directory of Middleboro, Massachusetts. For 1897 (Needham, MA: A. E. Foss & Co., nd. ), p. 81/United States Federal Census. Year: 1900; Census Place: Middleborough, Plymouth, Massachusetts; Roll T623_674; Page: 19A; Enumeration District: 1135. 1900 United States Federal Census (on-line database). Provo, UT: Ancestry.com Operations Inc, 2004. Original data: United States of America, Bureau of the Census. Twelfth Census of the United States, 1900. Washington, D.C.: National Archives and Records Administration, 1900. T623, 1854 rolls/United States Federal Census. Year: 1920;Census Place: Rockland, Plymouth, Massachusetts; Roll T625_727; Page: 5A; Enumeration District: 140; Image: 620. 1920 United States Federal Census (on-line database). Provo, UT: Ancestry.com Operations Inc, 2009. Original data: Fourteenth Census of the United States, 1920; (National Archives Microfilm Publication T625, 2076 rolls); Records of the Bureau of the Census, Record Group 29; National Archives, Washington, D.C./U.S. Marine Corps Muster Rolls, 1798-1940 (on-line database). Provo, UT: Ancestry.com Operations Inc, 2007. Original data: Muster Rolls of the U.S. Marine Corps, 1798-1892; (National Archives Microfilm Publication T1118, 123 rolls); Records of the U.S. Marine Corps, Record Group 127; National Archives, Washington, D.C., and U.S. Marine Corps Muster Rolls, 1893-1940; (National Archives Microfilm Publication T977, 460 rolls); Records of the U.S. Marine Corps, Record Group 127; National Archives, Washington, D.C./U.S. Army, Register of Enlistments, 1798-1914 (on-line database). Provo, UT: Ancestry.com Operations Inc, 2007. Original data: Register of Enlistments in the U.S. Army, 1798-1914; (National Archives Microfilm Publication M233, 81 rolls); Records of the Adjutant General’s Office, 1780’s-1917, Record Group 94; National Archives, Washington, D.C./World War I Draft Registration Cards. Registration Location: Plymouth County, Massachusetts; Roll 1685067; Draft Board: 2. World War I Draft Registration Cards, 1917-1918 (on-line database). Provo, UT: Ancestry.com Operations Inc, 2005. Original data: United States, Selective Service System. World War I Selective Service System Draft Registration Cards, 1917-1918. Washington, D.C.: National Archives and Records Administration. M1509, 4,582 rolls. Middleboro Gazette, “What the Gazette Was Saying Twenty Five Years Ago”, May 4, 1923:10 (enlists in RI militia); ibid., May 18, 1923:10 (only Rock boy)/National Archives and Records Administration. Civil War Pension Index: General Index to Pension Files, 1861-1934 (on-line database). Provo, UT: Ancestry.com Operations Inc, 2000. Original data: General Index to Pension Files, 1861-1934. Washington, D.C.: National Archives and Records Administration. T288, 544 rolls/Roster of the 1st Rhode Island Volunteer Infantry, The Spanish American War Centennial Website/United States Federal Census. Year: 1930; Census Place: Easton, Bristol, Massachusetts; Roll 886; Page: 2B; Enumeration District: 183; Image: 897.0. 1930 United States Federal Census (on-line database). Provo, UT: Ancestry.com Operations Inc, 2002. Original data: United States of America, Bureau of the Census. Fifteenth Census of the United States, 1930. Washington, D.C.: National Archives and Records Administration, 1930. T626, 2,667 rolls. Middleboro Gazette, March 9, 1906:1; March 14, 1913:1; September 12, 1919:1 (employed Betty’s Neck Co.); August 18, 1922:1 (injured at mill); “What the Gazette Was Saying Twenty Five Years Ago”, June 22, 1923:9 (enlists); ibid., June 29, 1923:9 (ships out from town); ibid., April 4, 1924:6 (named among returning soldiers); May 30, 1924:1 (injured by falling log); February 27, 1925:1 (sells Lakeville property); March 13, 1925:1,9 (moves to Middleborough); October 16, 1925:10; January 15, 1926:1; “Old Middleborough”, July 17, 1931:1 (pictured as member Co. D); March 30, 1934:1; April 17, 1936:1 (obituary)/National Archives and Records Administration. Civil War Pension Index: General Index to Pension Files, 1861-1934 (on-line database). Provo, UT: Ancestry.com Operations Inc, 2000. Original data: General Index to Pension Files, 1861-1934. Washington, D.C.: National Archives and Records Administration. T288, 544 rolls/Taunton, Massachusetts, Directory for 1893 (Taunton, MA: Sampson, Murdock & Co., 1893)/United States Federal Census. Year: 1880; Census Place: Taunton, Bristol, Massachusetts; Roll T9_526; Family History Film: 1254526; Page: 423.4000; Enumeration District: 123; Image: 0216. 1880 United States Federal Census (on-line database). Provo, UT: Ancestry.com Operations Inc, 2005. Original data: United States of America, Bureau of the Census. Tenth Census of the United States, 1880. Washington, D.C.: National Archives and Records Administration, 1880. T9, 1,454 rolls/United States Federal Census. Year: 1900; Census Place: Taunton Ward 4, Bristol, Massachusetts; Roll T623_639; Page: 14B; Enumeration District: 226. Ancestry.com. 1900 United States Federal Census (on-line database). Provo, UT: Ancestry.com Operations Inc, 2004. Original data: United States of America, Bureau of the Census. Twelfth Census of the United States, 1900. Washington, D.C.: National Archives and Records Administration, 1900. T623, 1854 rolls/United States Federal Census. Year: 1910; Census Place: Lakeville, Plymouth, Massachusetts; Roll T624_612; Page: 9A; Enumeration District: 1221; Image: 316. 1910 United States Federal Census (on-line database). Provo, UT: Ancestry.com Operations Inc, 2006. Original data: United States of America, Bureau of the Census. Thirteenth Census of the United States, 1910. Washington, D.C.: National Archives and Records Administration, 1910. T624, 1,178 rolls/United States Federal Census. Year: 1930; Census Place: Middleborough, Plymouth, Massachusetts; Roll 940; Page: 37A; Enumeration District: 79; Image: 659.0. 1930 United States Federal Census (on-line database). Provo, UT: Ancestry.com Operations Inc, 2002. Original data: United States of America, Bureau of the Census. Fifteenth Census of the United States, 1930. Washington, D.C.: National Archives and Records Administration, 1930. T626, 2,667 rolls. Middleboro Gazette, April 19, 1907:2 (daughter born); August 20, 1909:4 and June 3, 1910:3 (purchases land); July 1, 1910:4 (moves from Muttock to No. Lakeville); October 21, 1910:6 (sells North St. house to Ritter); March 3, 1911:3 (son born); August 23, 1912:4 (moves house); August 1, 1913:4 (10th wedding anniversary); “What the Gazette Was Saying Twenty Five Years Ago”, June 22, 1923:9 (enlists); ibid., June 29, 1923:9 (ships out from town); November 9, 1923:6 (house rebuilt); January 11, 1924:3 (occupies new house); “What the Gazette Was Saying Twenty Five Years Ago”, April 4, 1924:6 (named among returning soldiers); ibid., August 1, 1924:6 (joins Mass. militia); March 13, 1925:8; “Old Middleborough”, July 17, 1931:1 (pictured as member Co. D); “Recent Death”, January 2, 1958:7 (obituary)/National Archives and Records Administration. Civil War Pension Index: General Index to Pension Files, 1861-1934 (on-line database). Provo, UT: Ancestry.com Operations Inc, 2000. Original data: General Index to Pension Files, 1861-1934. Washington, D.C.: National Archives and Records Administration. T288, 544 rolls/Resident and Business Directory of Middleboro, Massachusetts. For 1897 (Needham, MA: A. E. Foss & Co., nd. ), p. 90/Resident and Business Directory of Middleboro’ and Lakeville, Massachusetts, for 1899 (Needham, MA: A. E. Foss & Co., nd. ), p. 90. Middleboro Gazette, August 31, 1906:4 (employed in Missouri); May 31, 1907:4 (editor); “What the Gazette Was Saying Twenty Five Years Ago”, April 27, 1923:5 (stationed in Boston with Navy); ibid., June 19, 1925:6 (accepts Harvard post); October 21, 1932:4 (son born)/Resident and Business Directory of Middleboro, Massachusetts. For 1897 (Needham, MA: A. E. Foss & Co., nd. ), p. 98/United States Federal Census. Year: 1920;Census Place: St Louis Ward 5, St Louis (Independent City), Missouri; Roll T625_949; Page: 12B; Enumeration District: 101; Image: 108. Ancestry.com. 1920 United States Federal Census (on-line database). Provo, UT: Ancestry.com Operations Inc, 2009. Original data: Fourteenth Census of the United States, 1920; (National Archives Microfilm Publication T625, 2076 rolls); Records of the Bureau of the Census, Record Group 29; National Archives, Washington, D.C.
Middleboro Gazette, August 25, 1911:1 (trapped in freight car); September 29, 1911:6; December 20, 1912:1; December 27, 1912:5 (subscription for widow); January 10, 1913:1 (inquest into death and findings); February 14, 1913:6 (petition for administration of estate); March 14, 1913:5 (railroad settles sum on family); ibid., (administrator appointed); “What the Gazette Was Saying Twenty Five Years Ago”, June 22, 1923:9 (enlists); ibid., June 29, 1923:9 (ships out from town); ibid., July 6, 1923:6 (mustered in as corporal); ibid., April 4, 1924:6 (named among returning soldiers); “Old Middleborough”, December 11, 1925:1 (old firefighters at station pictured); ibid., July 17, 1931:1 (pictured as member Co. D)/Resident and Business Directory of Middleboro’ and Lakeville, Massachusetts, for 1899 (Needham, MA: A. E. Foss & Co., nd. ), p. 95. Middleboro Gazette, “What the Gazette Was Saying Twenty Five Years Ago”, January 30, 1925:7 (stationed in the Philippines)/U.S. Army, Register of Enlistments, 1798-1914 (on-line database). Provo, UT: Ancestry.com Operations Inc, 2007. Original data: Register of Enlistments in the U.S. Army, 1798-1914; (National Archives Microfilm Publication M233, 81 rolls); Records of the Adjutant General’s Office, 1780’s-1917, Record Group 94; National Archives, Washington, D.C.
Middleboro Gazette, “What the Gazette Was Saying Twenty Five Years Ago”, June 22, 1923:9 (enlists); ibid., June 29, 1923:9 (ships out from town); ibid., July 6, 1923:6 (mustered in as artificer); ibid., April 4, 1924:6 (named among returning soldiers)/Resident and Business Directory of Middleboro, Massachusetts. For 1897 (Needham, MA: A. E. Foss & Co., nd. ), p. 102. Middleboro Gazette, “What the Gazette Was Saying Twenty Five Years Ago”, April 27, 1923:5 (leaves for Fort Warren)/National Archives and Records Administration. Civil War Pension Index: General Index to Pension Files, 1861-1934 (on-line database). Provo, UT: Ancestry.com Operations Inc, 2000. Original data: General Index to Pension Files, 1861-1934. Washington, D.C.: National Archives and Records Administration. T288, 544 rolls/Old Colony Memorial, “County and Elsewhere”, May 21, 1898:4/Resident and Business Directory of Middleboro, Massachusetts. For 1897 (Needham, MA: A. E. Foss & Co., nd. ), p. 106/Roster of the 1st Massachusetts Volunteer Heavy Artillery Battalion, The Spanish American War Centennial Website/United States Federal Census. Year: 1930; Census Place: Los Angeles, Los Angeles, California; Roll 132; Page: 1B; Enumeration District: 22; Image: 1047.0. Ancestry.com. 1930 United States Federal Census (on-line database). Provo, UT: Ancestry.com Operations Inc, 2002. Original data: United States of America, Bureau of the Census. Fifteenth Census of the United States, 1930. Washington, D.C.: National Archives and Records Administration, 1930. T626, 2,667 rolls. Middleboro Gazette, April 27, 1906:4 (completes enlistment); April 27, 1917:1 (recruitment committee)/United States Federal Census. Year: 1930; Census Place: Middleborough, Plymouth, Massachusetts; Roll 940; Page: 23A; Enumeration District: 79; Image: 631.0. 1930 United States Federal Census (on-line database). Provo, UT: Ancestry.com Operations Inc, 2002. Original data: United States of America, Bureau of the Census. Fifteenth Census of the United States, 1930. Washington, D.C.: National Archives and Records Administration, 1930. T626, 2,667 rolls. Middleboro Gazette, “What the Gazette Was Saying Twenty Five Years Ago”, July 13, 1923:5 (enlists, at Chickamauga); June 19, 1931:1, 4 (death notice an obituary)/National Archives and Records Administration. Civil War Pension Index: General Index to Pension Files, 1861-1934 (on-line database). Provo, UT: Ancestry.com Operations Inc, 2000. Original data: General Index to Pension Files, 1861-1934. Washington, D.C.: National Archives and Records Administration. T288, 544 rolls/United States Federal Census. Year: 1870; Census Place: Wareham, Plymouth, Massachusetts; Roll M593_639; Page: 808A; Image: 784; Family History Library Film: 552138. Ancestry.com. 1870 United States Federal Census (on-line database). Provo, UT: Ancestry.com Operations, Inc., 2009. Original data: 1870 U.S. census, population schedules. NARA microfilm publication M593, 1,761 rolls. Washington, D.C.: National Archives and Records Administration, n.d./United States Federal Census. Year: 1930; Census Place: Rutland, Worcester, Massachusetts; Roll 965; Page: 5A; Enumeration District: 259; Image: 583.0. Ancestry.com. 1930 United States Federal Census (on-line database). Provo, UT: Ancestry.com Operations Inc, 2002. Original data: United States of America, Bureau of the Census. Fifteenth Census of the United States, 1930. Washington, D.C.: National Archives and Records Administration, 1930. T626, 2,667 rolls/Webber, Harry E., comp. Twelve Months with the Eighth Massachusetts Infantry in the Service of the United States (Salem, MA, USA: Newcomb and Gauss, Printers, 1908), p. 258. Middleboro Gazette, “What the Gazette Was Saying Twenty Five Years Ago”, May 11, 1923:6 (enlists); ibid., July 6, 1923:6 (escapes injury at Santiago); ibid., February 22, 1924:6 (mustered out)/U.S. National Homes for Disabled Volunteer Soldiers, 1866-1938 (on-line database). Provo, UT: Ancestry.com Operations Inc, 2007. Original data: Historical Register of National Homes for Disabled Volunteer Soldiers, 1866-1938; (National Archives Microfilm Publication M1749, 282 rolls); Records of the Department of Veterans Affairs, Record Group 15; National Archives, Washington, D.C.
Middleboro Gazette, February 8, 1907:4 and July 18, 1913:3 (Boston firefighter); “What the Gazette Was Saying Twenty Five Years Ago”, May 4, 1923:10 (USS Catskill); ibid., July 13, 1923:5 (promoted to Machinist First Class). Middleboro Gazette, “What the Gazette Was Saying Twenty Five Years Ago”, June 22, 1923:9 (enlists); ibid., June 29, 1923:9 (ships out from town); ibid., April 4, 1924:6 (named among returning soldiers); ibid., July 17, 1931:1 (pictured as member Co. D); “Recent Deaths”, July 14, 1944:5 (obituary)/National Archives and Records Administration. Civil War Pension Index: General Index to Pension Files, 1861-1934 (on-line database). Provo, UT: Ancestry.com Operations Inc, 2000. Original data: General Index to Pension Files, 1861-1934. Washington, D.C.: National Archives and Records Administration. T288, 544 rolls/Resident and Business Directory of Middleboro’ and Lakeville, Massachusetts, for 1899 (Needham, MA: A. E. Foss & Co., nd. ), p. 116. Gravestone Record, Reed Cemetery, Marion Road, Middleborough, MA/Headstones Provided for Deceased Union Civil War Veterans, 1879-1903 (on-line database). Provo, UT: Ancestry.com Operations Inc, 2007. Original data: Card Records of Headstones Provided for Deceased Union Civil War Veterans, ca. 1879-ca. 1903; (National Archives Microfilm Publication M1845, 22 rolls); Records of the Office of the Quartermaster General, Record Group 92; National Archives, Washington, D.C./National Archives and Records Administration. Civil War Pension Index: General Index to Pension Files, 1861-1934 (on-line database). Provo, UT: Ancestry.com Operations Inc, 2000. Original data: General Index to Pension Files, 1861-1934. Washington, D.C.: National Archives and Records Administration. T288, 544 rolls. Middleboro Gazette, October 9, 1908:1; “What the Gazette Was Saying Twenty Five Years Ago”, June 29, 1923:9 (ships out from town); ibid., April 4, 1924:6 (named among returning soldiers); ibid., July 18, 1924:7 (enlists in 26th); ibid., May 1, 1925:8 (writes home); ibid., March 12, 1926:6 (returns from Philippines); “Old Middleborough”, July 17, 1931:1 (pictured as member Co. D)/United States Federal Census. Year: 1930; Census Place: Quincy, Norfolk, Massachusetts; Roll 936; Page: 1B; Enumeration District: 96; Image: 491.0. Ancestry.com. 1930 United States Federal Census (on-line database). Provo, UT: Ancestry.com Operations Inc, 2002. Original data: United States of America, Bureau of the Census. Fifteenth Census of the United States, 1930. Washington, D.C.: National Archives and Records Administration, 1930. T626, 2,667 rolls. It is hoped to supplement the information posted here with additional information as it becomes known.